When I learned that Drew Barrymore was attached to direct a movie called Heist Society, based off a young adult novel of the same name, I instantly thought it was the right fit. I didn’t know much about Heist Society, besides a brief summary. But I knew that Barrymore was the right person to tackle a teenage Ocean Eleven’s kind of thing. After seeing Whip It, Barrymore proved that she was a capable director. Therefore, I decided to pick up Heist Society and give it a read. 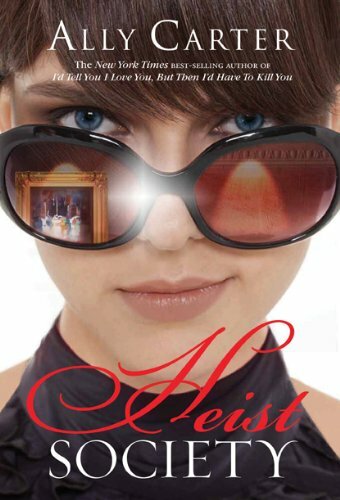 Heist Society follows Katarina Bishop, a teenage girl born into a family of con men. Her whole life, she played a role in her dad’s heists, helping him steal priceless works of arts from other criminals. She decides that she had enough of that life and enrolls into boarding school. But Kat starts to realize that it’s hard to run away from that life and her family, especially when her father is being targeted by a vicious criminal, Arturo Taccone. Kat must do and steal the impossible before Arturo makes his threats a reality. The book is fun, light read. Despite the subject matter, the drama never gets too heavy or serious. In fact, at instances the characters overdramatize a bit too much; it almost laughable. The plot was complex enough to keep me reading and interested. Kat travels all over Europe to find the paintings that she must steal back for Taccone. Luckily, she has the assistance of her crew. Kat’s right-hand man is Hale, a handsome rich boy is who obviously smitten by Kat, and of course, she doesn’t realize it. Gabrielle is Kat’s beautiful, leggy cousin. The two don’t get along, but as a team, they get stuff done. Also part of the crew is Simon, the tech expert and the Bagshaw brothers. When reading the book, I felt the style was more ABC Family quality. The writing is decent; I would’ve preferred a little more description. But the pacing is fast, and with a story like this, it works. Once I got to the end, I saw all the potential this story could turn into on film. It definitely has an Oceans Eleven’s vibe. Though I do think only teenage audiences would be interested, unless they upped the ages of the main characters. Regardless, Heist Society was a fun, quick read. Whenever I’m looking for something entertaining and light, I’ll pick up its sequel, Uncommon Criminals, to see what’s up with Kat and the gang. Support our site and purchase Heist Society and/or Uncommon Criminals from our TYF Store! Don’t forget about our latest TYF Giveaway Contest! Click here for details on how to enter! Next ArticleMusic review: New singles by Florence & The Machine, David Guetta ft Nicki Minaj, Cobra Starship ft Mac Miller!